Simple and straightforward, Lasky’s book consists of 19 short pages that offer her view of poetry. The lineage of her thinking about the creative process is complicit with my own. Throughout this short essay it was easy to substitute “visual art” or “painting” every time she refers to a poem or poetry. Nowadays, poetry critics and scholars often refer to an entire body of work by one poet as a “project,” but I don’t think poems work that way. I think poems come from the earth and work through the mind from the ground up. I think poems are living things that grow from the earth into the brain, tather than things that are planted within the earth by the brain. I think a poet intuits a poem. When people talk about poetry as a project, they suggest that the road through a poem is a single line. When really the road through a poem is a series of lines, like a constellation, all interconnected. Poems take place in the realm of chance, where the self and the universal combine. Having a project (and naming it) is a powerful tool. A poet with a nameable project seems wise…But this kind of thinking strikes me as a load of BS…I think that if you really are a poet, you don’t think this is how poetry works. To create something like a poem, means that the outside world of an artist and the internal drives within her blend and blur. But there is something so human, so instinctual about the drive, that it might be hard to be conscious of it enough to name it. Naming your intentions is great for some things, but not for poetry. Projects are bad for poetry…I think the notion of a poetic project may actually be very toxic to poetry. It’s hard enough to create a poem. If he is destined to be a great poet, he will never know what his project really was, no matter what he says it is, was, or what he might imagine it could be. Which is to say that a poem, as a thing, resists being talked about linearly in its very nonlinearity. What differentiates a great poet from a not-great one is the capacity to exist in that uncertain space, where the grand external world (which means anything and everything) folds into the intense internal world of the individual. 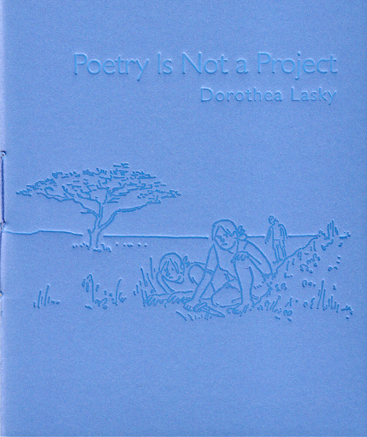 Note on the author: Dorothea Lasky has published two volumes of poetry, Awe (2007) and Black Life (2010). For more information, visit her website, Birds in Snow. I was just on the Ugly Duckling site a few days ago. Not surprised we are in synch! loved the book. brave, honest, and inspiring.